Today is a special day for all Full House fans. Exactly 25 years ago, on September 22, 1987, ABC broadcasted the very first episode of Full House. For eight seasons and 192 episodes, the show stole the hearts of millions of people worldwide, and it still does! Since it's cancellation in 1995, the show has continuously been in syndication and new generations are now growing up with the Tanner family. 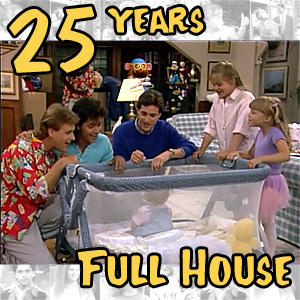 So to all Full House fans and of course to all of the former cast and crew of this great show: HAPPY 25TH ANNIVERSARY! Of course you can talk about this milestone on the forums. The entire Full House Cast, except for Mary-Kate and Ashley Olsen and Blake & Dylan Tuomy-Wilhoit, came together on September 22, 2012 to celebrate the 25th anniversary of Full House. The Olsen twins are said to be busy promoting their perfume, and therefore they weren't able to attend the reunion. Candace Cameron-Bure put some photographs and insights on the cast reunion in a blogpost. The very first scene of Full House. This is how it all began in 1987.